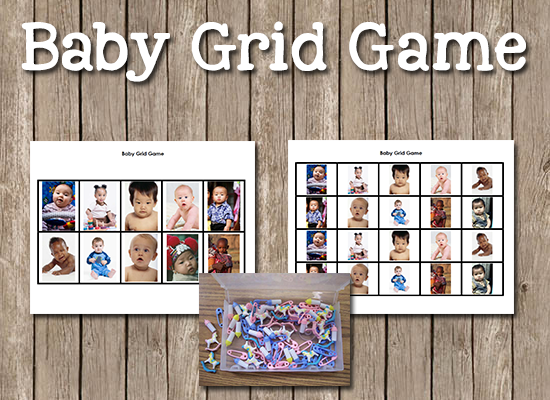 Find more Family Theme Activities for Pre-K on the category page. 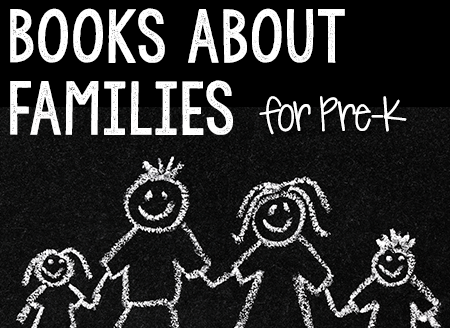 Check here for a complete list of Books about Families! 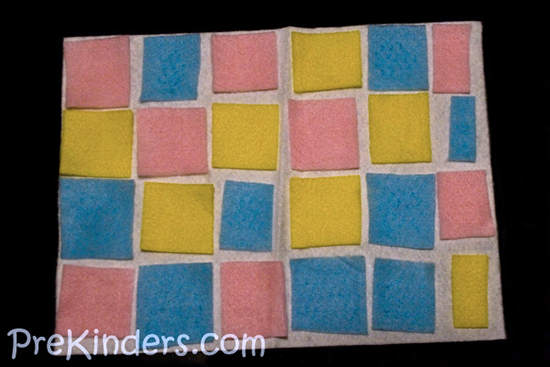 Children glue small squares of fabric to a piece of felt to make a “baby blanket”. 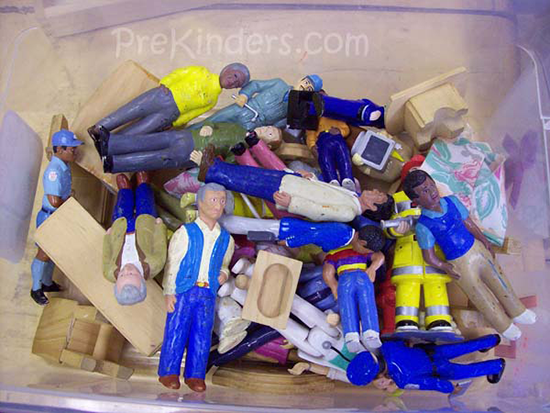 Children use it with the classroom baby dolls to role play taking care of a baby. Or, if you prefer, you can call it a family quilt. 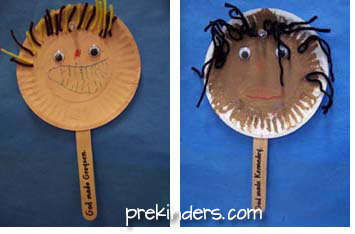 Children use multicultural paint to paint a small paper plate, add yarn hair to match the color of their own hair, add wiggle eyes, and draw a nose and mouth. These are taped to a craft stick to make a puppet. 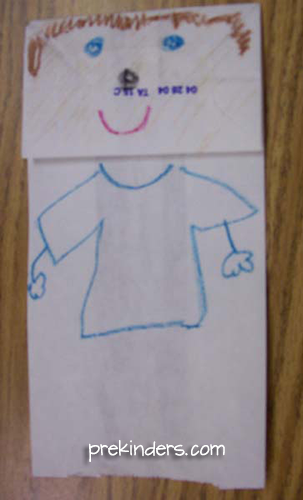 Children make a puppet of one of their family members using a paper bag. 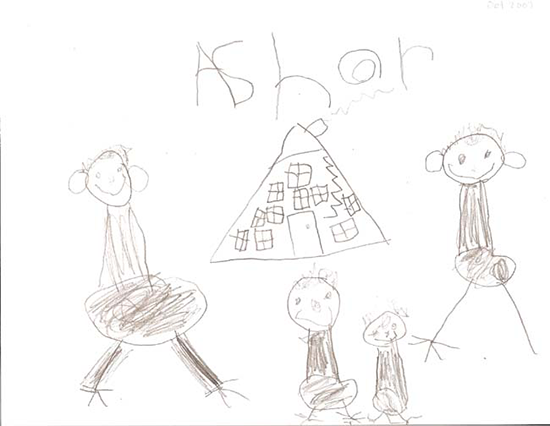 Children draw a picture their family members. Add bear family cookie cutters (made by Wilton) to the play dough area. Children use these to cut out the different sizes of bears to make the bear family. 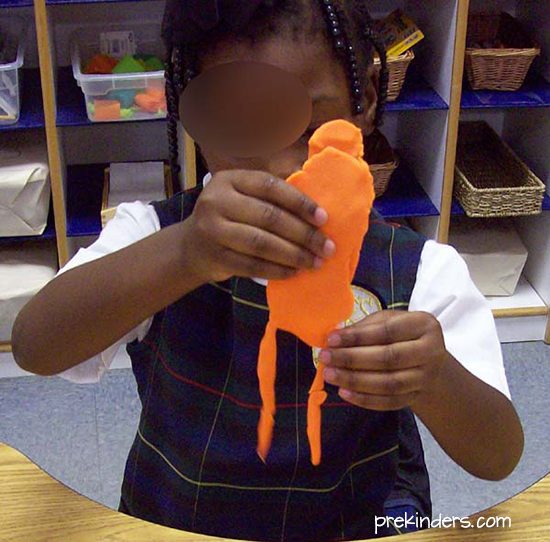 Children can make people with the play dough. Encourage them to make a family. Add Barbie shoes to the area for the children to add to the feet of their family. Be sure to include shoes for women, men, and children. 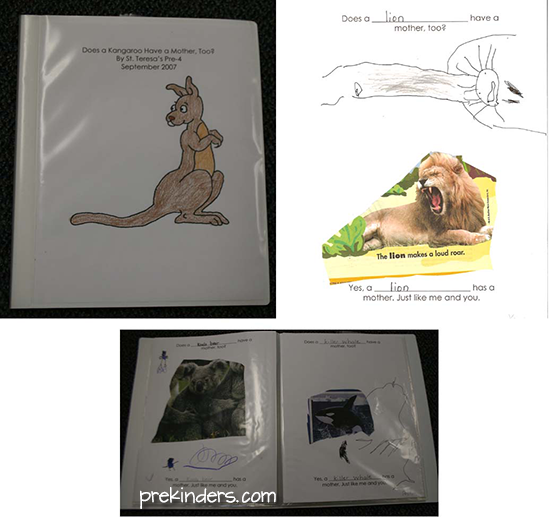 After we read the book, Does a Kangaroo Have a Mother, Too?, by Eric Carle, we made a our own class book. Each page of our book says, “A ____ has a mother, too. Just like me and you.” Children cut a picture of an animal from a magazine and glued it on the page. I found great animal pictures in Your Big Backyard magazine. 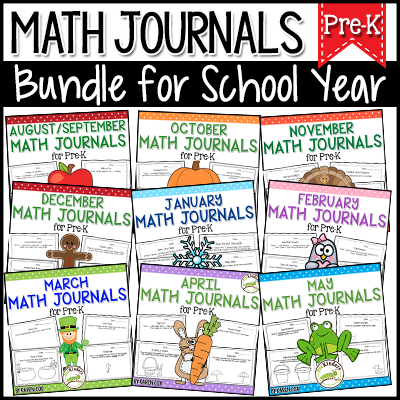 To make our class books, I use “presentation book covers” from an office supply store or Walmart. It has a sturdy plastic cover with a clear insert, and the pages are also clear inserts. I just slip in a page for the front cover, and slip in the children’s pages inside. These can be reused. 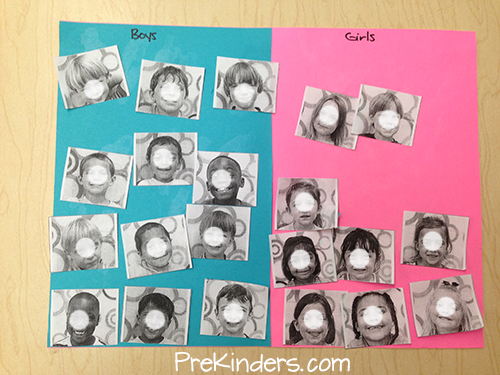 Children classify photos of classmates and glue them on paper divided into two sections: “boys” and “girls”. To read more about this, see the blog post here: Classification with Photos. An alternate activity would be to classify the pictures as “children” and “parents”. I have done both. We use the floor graph and people figures from the block center. We graph how many boys and girls are in the class, each child placing a people figure on the graph to represent themselves. We count and compare most/least/same. We make other graphs: Do you have sisters? Do you have brothers? This song book for All I Really Need can be printed or projected as a slideshow. 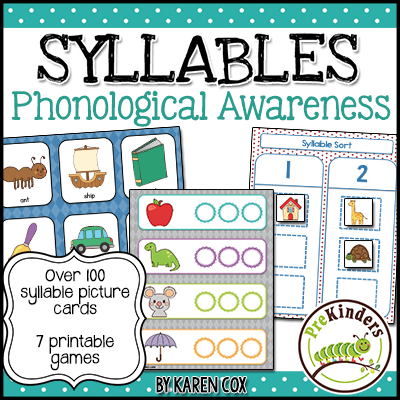 Go to the Song Books page to download. Children bring family photos to school to share with the class. I add these photos to the children’s portfolio notebooks. 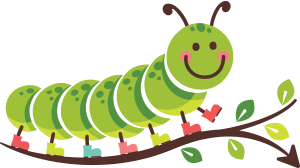 After reading the book, Jonathan and His Mommy, go through the book once more, and have the children walk in the same ways that Jonathan does. Add people figures that represent different races and ages to the block center.